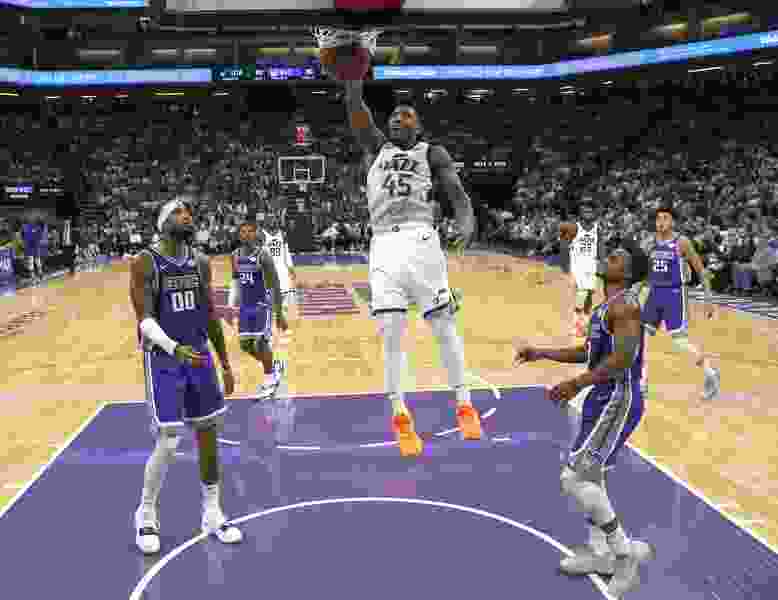 Three thoughts on the Utah Jazz’s 123-117 win over the Sacramento Kings from Salt Lake Tribune beat writer Andy Larsen. This was a surprise. After the Jazz came out and just stomped all over the Kings early last Thursday, Sacramento coach Dave Joerger changed up his starting lineup Wednesday night, putting in Nemanja Bjelica and Yogi Ferrell. That unit started the game on a 25-9 run, and will probably be one of the best stretches of play the Kings will have all season. Part of it, though, was that the Jazz’s starting guards weren’t playing well. Donovan Mitchell ended up being the game’s leading scorer, with 24 points, and did find his shot late. But early on, he was forcing shots (by his own admission), trying to make things happen that just weren’t going to happen. It’s somewhat incredible that a bad game from Mitchell still leads to 24 points, though. A bad game from Ricky Rubio, however, did not lead to points in the plural. 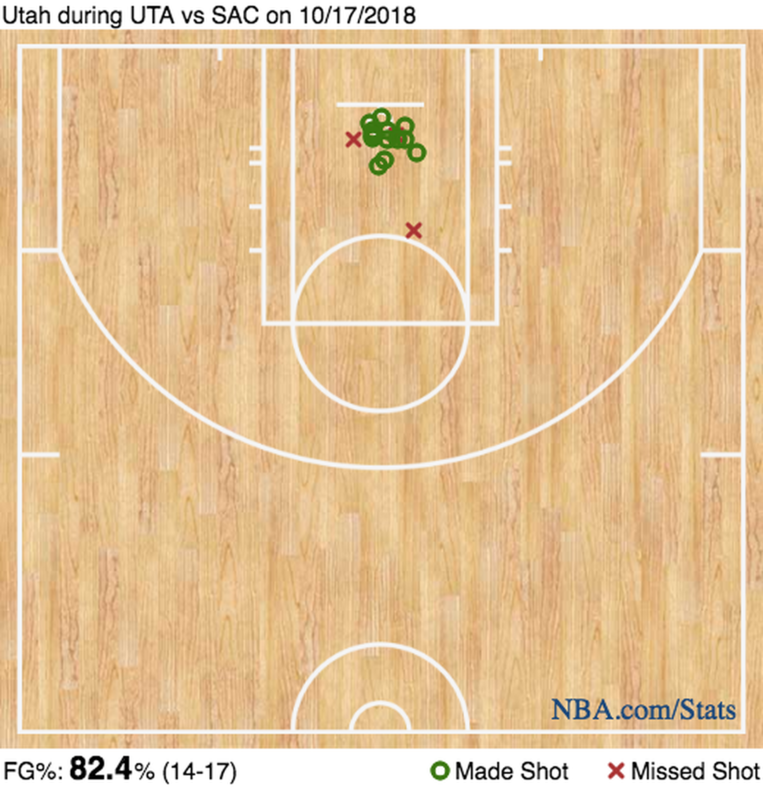 In fact, Rubio had only one point all night, a technical free-throw. He missed his four shots, including a layup, and the offense struggled with him in the game. But more problematic was the defense, as DeAaron Fox had little problem getting penetration against the slower Rubio. Fox is one of the fastest players in the league, and Rubio just wasn’t a good matchup, at least not on this night. So enter Dante Exum and Alec Burks. Exum ended up playing 26 minutes on the night, more than Rubio, and made a difference from the get go, knocking down a three, then finding Rudy Gobert for easy points inside. Exum has more speed than Rubio, and did a much better job of staying in front on defense as well. Exum’s offensive game can be a little predictable: it’s built around his speed and attacking the basket when given a sliver of a window. That’s not necessarily a bad thing, especially if a team can’t keep up. But think about how frequently he drives baseline, especially in comparison to other Jazz players. Tonight, though, those drives worked, thanks to some tremendous timing with his teammates' cuts to the rim, and some really nice reads by Exum. Burks was the second man off the bench for Snyder Wednesday, after Jae Crowder. Burks, too, made an impact just as soon as he stepped on the floor. He attacked wisely, made all three of his 3-point shots, and made the right reads in pick and roll and transition, finishing with four assists. He ended up with a game-high +25 in only 18 minutes on the floor. Look at that! Again, the knock on Burks for his career is that he’s empty calories: good at getting points, but not great at helping your team on the scoreboard overall. But if what we’ve seen from him in preseason and game one is real, he’ll shake that reputation in a big way. Joe Ingles was phenomenal tonight, in my mind the Jazz’s best player. He finished with 22 points on 9-12 shooting, as well as picking up six assists and four steals. He dunked in transition, even though it was contested. Dunks per season Ingles has averaged in his career: 4.25. He had a 15-foot mid-range floater. The number of floaters Ingles made in the first three entire seasons of his career: five. A 3-point shot after a direct hand-off from Derrick Favors, when the defender went under. He’s certainly taken more of these, but is far more likely to take this shot now. A straight-line drive layup after just beating his man off the dribble using his blazing speed. Okay, admittedly, his defender was Bjelica. But still! A casual semi-fast break pull-up three. The number of times he’s made a pull-up three with 22-18 seconds left on the shot clock in his career: three. A step-back pull-up three after Bjelica died on the screen. This is a shot we’ve seen from Ingles before, but is still a difficult look that he made look easy. A snaking pick and roll 12-foot floater. See point number two. A catch-and-shoot three after a beautiful “elevator doors” play, the first Jazz play after halftime. This is more “normal” Ingles stuff, but it’s still fun to see. A quick layup way up off the top of the backboard that sank in for two points over Willie Cauley-Stein. This was an impressive finish. Just look at the variety there. Ingles isn’t just a catch-and-shoot player anymore, he’s a versatile scorer. To be fair, he did collect five turnovers as well, but he was such an integral part of the Jazz’s offense that it’s a little bit understandable. That has been a knock on Jingles' game in the past, though, and it’s something to watch moving forward. Derrick Favors and Rudy Gobert didn’t have their best defensive games. The easiest way to tell, obviously, is that 117 Kings point total, though there were a ton of possessions in this game, and the Jazz’s defensive rating ended up being about 108.3. That’s not catastrophic, but it’s not great either; it would have ranked 16th in the league over the full course of the season last year. In particular, Cauley-Stein and Bjelica had a lot of success inside. Cauley-Stein, especially, just jumped over Favors and Gobert at times, an impressive feat. Gobert credited that to being “a step too slow” on the defensive end, something that he vowed to fix before Friday’s game against Golden State. But Favors and Gobert were fantastic at finishing around the rim tonight. Gobert finished with 19 points on 7-9 shooting, and Favors finished with 18 points on 7-8 shooting. Both showed good patience and improved core strength to be able to catch, readjust, and get dunks or layups with relative ease. When two players combine for nearly 40 points on 17 shots, it can make up for many sins. In tonight’s case, the Jazz survived taking 16 fewer shots than the Kings (95-79), allowing 93 points from the Kings' starters, and turning the ball over 18 times because of their success from their most efficient scoring options.